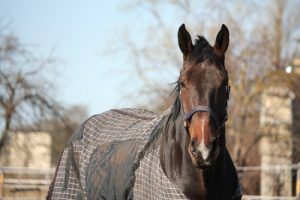 Arbitrage offers a full-service laundry service for your horse’s dirty blankets, coolers, and saddle pads. For all the blanket Houdinis, we also provide blanket and cooler repairs- including tears, rips, damaged hardware, and missing surcingles or leg straps. We use high-quality detergents, waterproofing, and deodorizers from Nikwax. Nikwax is used by many outdoorsmen to increase the durability and waterproofing from the elements. 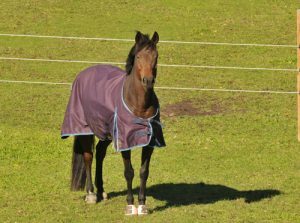 Thanks to Nikwax and their technology, we can help you keep your horse drier! Each wash includes a pre-rinse, wash, and re-rinse cycle. This ensures the material is not damaged and removes any surfactants that may irritate the horse’s skin. Excessively dirty blankets are cycled through our washers twice; moldy or urine-soaked blankets are pre-treated, and hairy blankets are carefully hand-picked for an additional price. All velcro is hand-picked to remove hair, the fleece collar is cleaned and carted to rejuvenate the material and improve comfort. Waterproofing is also available for most blankets. All of our waterproofing is hand-applied to improve the effectiveness of the waterproofing, keeping your horse clean and dry! Finally, your fresh and clean blankets are packed in an Arbitrage sack, re-useable for blanket storage and dirty laundry. See below for our pricing list, which includes repair quotes, excessive dirt/hair, and other miscellaneous damage repairs. Please contact store for price quotes. * Every attempt is made to match pattern, color, and plaid during repairing. Arbitrage Tack is not responsible for skrinkage, as certain manufacturing stretches the fibers; wash, rinse, and drying may decrease the overall size of the blanket due to this manufacturing process.